DAVIE, Fla. – Dental Fix Rx franchisee Humberto Gomez is featured in the November 2016 issue of Entrepreneur magazine (pages 79 and 80). 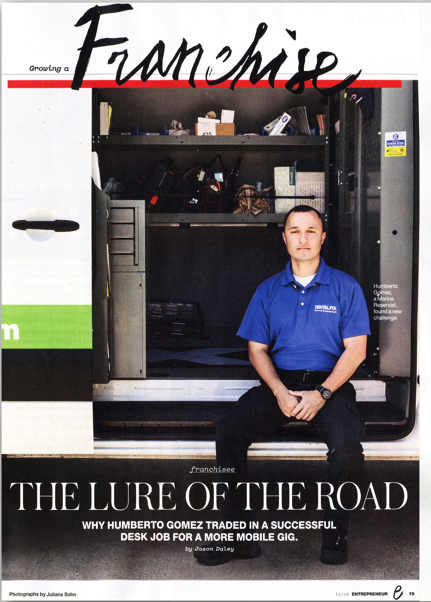 Titled “The Lure of the Road: Why Humberto Gomez Traded in a Successful Desk Job for a More Mobile Gig,” the article details Gomez’s initial entrepreneurial success, operating an insurance agency, and his decision to sell the business to launch his own Dental Fix Rx business. Like Gomez, all franchisees attend an intensive nine-week training program at the Dental Fix Rx corporate office to learn all the ins-and-outs of business operations as well as diagnosing equipment problems and how to repair them. Therefore, no prior industry experience is necessary to become a Dental Fix Rx franchisee. The corporate team also provides centralized technological and account management software services. The full article in Entrepreneur can be read online at https://www.dentalfixrx.com/franchise/2016-Entrepreneur-Dental-Fix-new.pdf. Anyone interested in operating their own Dental Fix Rx franchise can enjoy a special financing deal, if they sign a franchise agreement before the end of the year. Dental Fix Rx is offering to finance the $30,000 initial franchise fee for anyone who signs a franchise agreement with the company before January 1, 2017. Contact Scott Mortier at (773) 255-4095 or scott@dentalfixrx.com to learn more about the Dental Fix Rx franchise opportunity and special financing offer. Founded in 2009, Dental Fix Rx is a fast-growing mobile dental equipment repair service franchise that is revolutionizing the dental service industry by delivering immediate, on-demand equipment service, hand-piece repairs and cost-effective consumable products through its network of highly-trained franchise professionals. With local franchise owners serving businesses within their market, they complete repairs on-site from mobile repair centers that are equipped to fix a wide range of equipment found in any practice – from compressors to chair upholstery. The company has sold more than 250 franchises that service over 18,000 customers throughout North America. For more information, visit www.dentalfixrx.com. For franchise information, call (855) 242-5230 or visit www.dentalfixrx.com/franchise/. DAVIE, Fla. – Dental Fix Rx, a fast-growing mobile dental equipment repair service franchise, is taking its Discovery Day meetings on the road to the 2016 Greater New York Dental Meeting, held at the Jacob K. Javits Convention Center. Prospective franchisees are invited to attend the mobile Discovery Day events on November 28 & 29 to learn more about the Dental Fix Rx franchise opportunity. Discover Day attendees have the opportunity to tour a Dental Fix Rx mobile service center van and meet with local Dental Fix Rx franchisees as well as company executives. After the event, attendees are free to roam the show floor to meet with people from every aspect of the dental industry. The Greater New York Dental Meeting is the largest dental gathering in the United States with more than 54,000 attendees. “These mobile Discovery Day events create a unique opportunity for attendees to fully experience the dental industry. We can’t recreate this environment in our corporate office, so I highly encourage anyone who is remotely interested in the Dental Fix Rx franchise opportunity to attend,” said the company’s EVP of Business Development Scott Mortier. Another key benefit for prospective franchisees to attend the mobile Discovery Days is the limited time finance offer Dental Fix Rx recently announced. The franchise is offering to finance the $30,000 initial franchise fee for anyone who signs a franchise agreement with Dental Fix Rx before January 1, 2017. Dental Fix Rx will be operating out of the Darby Dental Supply booth (No. 800, 810). The franchise formed an exclusive partnership with the nation’s largest all-telesales dental products distributor earlier this year. Through a national service agreement, Dental Fix Rx franchisees provide dental equipment service and repair to all Darby Dental Supply customers. Space is limited. Contact Scott Mortier at (773) 255-4095 or scott@dentalfixrx.com to schedule a Discovery Day event. Dental Fix Rx will cover entry costs into the Greater New York Dental meeting. Prospects must first submit a franchise application to Dental Fix Rx. Dental Fix Rx may deny an application for any reason in its discretion. Financing will be provided by Dental Fix Rx’s affiliate, JDS Franchise Financing, LLC. The terms of such financing are set forth in Item 10 of Dental Fix Rx’s Franchise Disclosure Document. DAVIE, Fla. – Dental Fix Rx is offering to finance the $30,000 initial franchise fee for anyone who signs a franchise agreement with the mobile dental equipment repair service franchise before January 1, 2017. Dental Fix Rx is the only mobile franchise specialized in dental equipment repair services. In the past quarter, the company has signed 10 franchise agreements, bringing its total unit count to 250-plus franchises that operate in 37 U.S. states Canada, and services more than 18,000 customers. On average, Dental Fix Rx has sold and opened a new unit every week for the past 38 months, and adds around 1,000 new customers every quarter. The company expects to sign more than 75 new franchise agreements in 2016 and to sell all of its U.S. territories within the next three years. The Dental Fix Rx corporate team provides all franchisees an intensive nine-week training program, as well as centralized technological and account management software services. By handling the majority of the back-end office support through Dental Fix Rx’s proprietary software, franchise owners are able to solely focus on servicing customers. The company is also one of the only franchises to offer, under certain circumstances, a franchise guarantee – refunding the initial franchise fee if new owners do not service 40 customers within his or her first year of business, subject to specified conditions. Those interested in learning more about this special financing option should contact Scott Mortier at (773) 255-4095 or scott@dentalfixrx.com. Kelvin Hall served in the military for over 30 years. During this time, he traveled frequently and lived abroad in Dubai, Germany and Afghanistan. He worked as an Air Craft Mechanic for nine years, before receiving his undergraduate degree in Professional Aeronautics. After the military, Hall worked as a Program Manager for Boeing engineering for 15 years. Seeking entrepreneurship, Hall began researching franchises. There were many franchise options—especially a lot of food concepts—but Dental Fix Rx kept appearing at the top of the list. What attracted him to the business was the hands-on approach and ability to run the business by himself, involved in every level of operations. Fixing equipment came easy to him due to his extensive career experience, and his military background contributed to his strong life structure and self-discipline. Boeing contributed to his business knowledge, showing him how various areas of a business can impact a bottom line. The combination of both laid the foundation to pinpoint what he was trying to accomplish and how he was planning to achieve those goals. For instance, he currently is at 100+ customers and nearly 80 of them are repeat customers. Of course, his goals is to increase that number, but 30 percent of all his customers utilize Dental Fix Rx services for everything they repair at their practices. The real challenge was learning how to sell the services. I never really had to “sell” things in my career, so that was difficult. However, once I quickly learned the dental industry products and got more engrained in my business, I had no problem thoroughly explaining the benefits of using Dental Fix Rx over other companies. When I saw my first big sale come through. In 2016, at the Dental Fix Rx 3rd annual conference I received the Largest Invoice of the Year award. Success is my biggest motivator. I’ve always been a self-motivated and self-starter. I don’t need a supervisor watching over me. I know what I have to do to be successful. I also used my own funds to launch the business, I didn’t take out any loans, so seeing my investment through is another goal driver that allows me to effectively tackle my work load. Q: What is one of your routines that you don’t want to mess with? I have to hit the gym before I start my day. It clears my head and gives me the jump start I need to take on the day. I’m up by 4:30 a.m. to walk into the gym by 5 a.m., and am on the road to my first appointment by 8 a.m. Depending on the day, my last appointment can be anywhere from 4 p.m. – 6 p.m. or after hours. DAVIE, Fla. – Since launching this past June, Dental Fix Rx’s Rapid Repair program has become the preferred repair solution for hundreds of dental practices across the nation. With new and already repeat customers, Rapid Repair increased revenue substantial again last month. A majority of the repairs were handpieces, including high speed, slow speed and electrical attachments. The Rapid Repair process is simple – first, dental practices should sterilize all items to be repaired. Then, visit the Dental Fix repair site to complete the online repair form and receive a free, 2-day shipping label; the form should then be placed in a box and the shipping label attached to the outside of the package. Within 24 hours of receiving the equipment, Dental Fix Rx sends an email with a price estimate and to confirm the repairs. Dental professionals can expect to have the equipment back in their office within one week of shipping the item. Additionally, all repaired equipment comes with a warranty for three months to one year, depending on the product. Through the program, Dental Fix Rx provides repair services to all major brands using the highest quality components. Services include high and low speed handpieces, electric motors & attachments, electric control units, electric lab handpieces & control units, surgical motors & attachments, surgical control units, sonic scalers and ultrasonic scalers (all models & types). Rapid Repair offers free estimates and if the dentist ultimately chooses to not repair the item, Dental Fix Rx sends the equipment back free of charge. For more information, pricing or to place an order, visit https://rapidrepair.dentalfixrx.com/ or contact Dental Fix Rx at (844) 539-3513or rapidrepair@DentalFixRx.com. DAVIE, Fla. – September 30th, 2016 – Dental Fix RX, a national mobile dental equipment repair company, has officially signed a second franchise agreement with Fai Leung, a Dayton, Ohio-based entrepreneur. Marking the 262nd franchise for the brand and 29th franchise sale of 2016, Leung’s second franchise will be the 14th mobile repair van to launch in Ohio. DAVIE, Fla. – Dental practices throughout the United States are gaining more certainty when it comes to the health of their dental equipment thanks to Dental Fix Rx. The national mobile dental equipment repair service franchise has rolled out a new program that provides dental practices regular preventative maintenance and repair services at a flat monthly charge. Through the Unlimited Service Plan, or “USP”, dental practices are visited at least once a month by their local Dental Fix Rx operator whose goal is to prevent equipment from breaking. The Unlimited Service Plan covers preventative maintenance for all pieces of dental equipment, including hand pieces. The flat monthly fee varies depending on the size of the dental practice. Outside of the regular monthly rate, participating practices only pay for parts needed to complete a repair. All labor costs are included in the monthly fee, regardless of how many visits an operator makes to a dental practice within the month. For more information on the Unlimited Service Plan, visit www.dentalfixrx.com/usp.